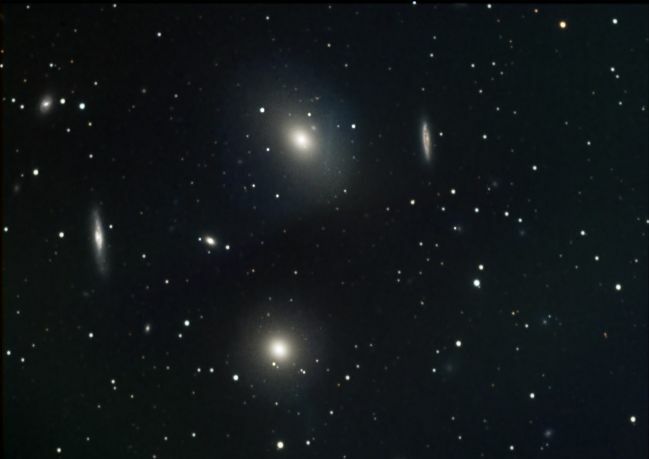 M84 and M86 are near the central core of the Virgo galaxy cluster. Both are massive elliptical galaxies located about 50 million light-years away. The Virgo cluster includes more then 2,000 galaxies. This galaxy supercluster has been described as a celestial wonderland of innumerable star cities. At least 100 galaxies in this group are within reach of an 8-inch amateur telescope. M84 and M86 are sometimes referred to as "the eyes," and form the beginning of a long curving chain of galaxies known as Markarian's Chain running eastward and then north near the Virgo-Coma border, ending with the bright spiral galaxy M88. Virgo has more Messier objects in it than any other constellation other than Sagittarius. Virgo has 11 objects in it that are include in the Messier catalog, and Sagittarius has 15. The constellation that is ranked third is Coma Berenices with 8 Messier objects. M84 is the bright elliptical galaxy near the lower center of the image, and M86 is the bright elliptical galaxy near the upper center of the image. A number of other galaxies are also visible in this image, including NGC 4402, NGC 4388, NGC 4387, NGC 4413, IC 3303, and several others. Hold your cursor over each galaxy in the above image and a pop-up window will appear to identify the galaxy. This is a composite CCD image taken with an SBIG ST-8E CCD on a Takahashi FCT-150 refractor with a reducer at f5.9. Data for this image encompasses exposures taken over three nights from my backyard. RA:12h 25m 13.7s Dec:+12d 52' 15"